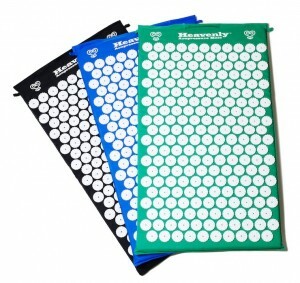 The mat is 29 x 17 x 1 inches and features 8820 acupressure points. Do not put in a washing machine or dryer because it may damage the points on the mat! To subscribe to the Heavenly Mats newsletter simply add your email below. A confirmation email will be sent to you! Heavenly Acupressure Mats for Natural Pain & Stress Relief, Deep Relaxation, & Wellness. ©2010-2017 Cezanne Franklin, Inc. All Rights Reserved.